Not being able to see employees face-to-face can really throw a wrench into your management style. Defusing conflicts, dealing with crises, delivering feedback (both positive and negative), monitoring work flow, offering support — your responsibilities as a manager get that much tougher when you can’t do it in person. Even something so simple as organizing an impromptu team meeting, or calling for a group brainstorming session can become that much more complicated when team members work off-site. Squabbles, altercations and arguments between employees you can’t even see face-to-face? Discipline issues, performance problems and lack of communication between your employees and yourself? The back-and-forth flow of information you need to make educated decisions regarding your people and your business? Legal issues and employment laws that are pertinent to remote employees? The challenges of creating a positive, professional virtual work environment? 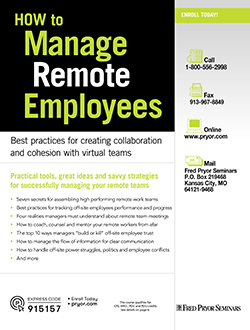 Your remote employees’ day-to-day performance and productivity?